A person never stands as tall as when they bend over to help a child..
One of the unfortunate truths in life is that sometimes it takes the worst things happening to us to bring out the best of our humanity. However that’s no reason not to shine a light on the profound acts of kindness we as humans share with each other in times of catastrophic stress regardless of what motivated those acts. Every year on the anniversary of our daughter Megan’s death we commemorate her life in some way. Maureen and I both fear this date because it’s an unwanted anniversary, the loss of our baby girl. The immense pain we endured and the profound sense of loss haunts us to this day. So each year we share parts of our journey down into the depths of every parents worst nightmare in an attempt to express the need of organ donations as well as the need for all of us to have compassion without condition. This date also reminds of the best humanity has to offer, the selfless and compassionate acts of family, friends, and even strangers. Our story this year is our attitude of gratitude. It as not just an honor to a brave young child, her fight for life and the tragic fight of a mother and father, but it’s an opportunity to focus not on our loss but of our gain for having had Megan in our lives, and to have had a group of heroes alongside us the entire time. We have had the opportunity to share with so many special people throughout the ordeal. We will shine a bright light of gratitude unto all the people, all the heroes in our story who worked so tirelessly and selflessly to assist us through our struggle to keep our daughter alive and to help us both hang on to a thread of sanity. We had just relocated from Manhattan to Belleville New Jersey searching out a nice community to raise our family. We were strangers in town with a newborn baby girl who would soon make us unwilling celebrities in the New Jersey town. It started with a visit to a pediatrician and ended in a tragedy, but as is usually the case if you follow the journey and not the destination you reveal the true heart of the story. During that often tumultuous journey there are a number of local heroes we want to recognize and have them be the focus of our anniversary this year. So here’s to our homegrown heroes…. The first star of the journey is the late Doctor Milton Prystowsky, a well known pediatric cardiologist. Dr. Milton sat with Megan for over an hour, the first time he met her, monitoring her heart rhythms because he believed he saw something wrong. He was the first one to listen to what we said about Megan’s discomfort. A very welcome comforting voice of reason and compassion after a slew of doctors who totally discounted our claims as what they perceived as first time parents over-reacting to a normal child’s illness. Most chalked it up to a new mother ranting and a new father whose only real medical knowledge was from what he watched on Marcus Welby or Medical Center. But she was much sicker than just an average childhood illness. With our instincts as parents we knew something wasn’t right and it was Dr. Milton who listened intently to all we said and incorporated our observations in his assessment. Megan suffered from myocarditis (an enlarged heart) and she quickly became a favorite patient of his. He would later spend hours saving her life after she had a stroke and cardiac arrest and even comforted us throughout the pregnancy and subsequent birth of our second beautiful daughter Kelllie. Unfortunately Dr. Milton has passed but he is forever woven deeply into our hearts and we are eternally grateful for all he did. Having found out how ill Megan really was another reality was about to rock our world. Even with decent medical coverage the medicines, the therapy, the time off from work, and the costs of frequent doctor visits spiraled out of control. After a cardiac arrest and stroke we were informed Megan now had cardiomyopathy, a condition which is irreversible. Megan needed a heart transplant and we would need to be ready to at the ring of a phone call to rush to the hospital. A local business person, Scott Harvin who was busy growing his own printing business listened to our story and decided something must be done to help. Along with his childhood friend Chris Otazo Scott began a local fundraising campaign to assist us not only with our bills, which had already placed extra burdens but with emotional support. In the beginning Megan was on seven medications given eight times a day, so many intervals it allowed for little sleep if any as well as frequent trips to hospitals. Scott and Chris started the Megan Jaret Heart Fund which grew exponentially as more members of our town heard of our plight. 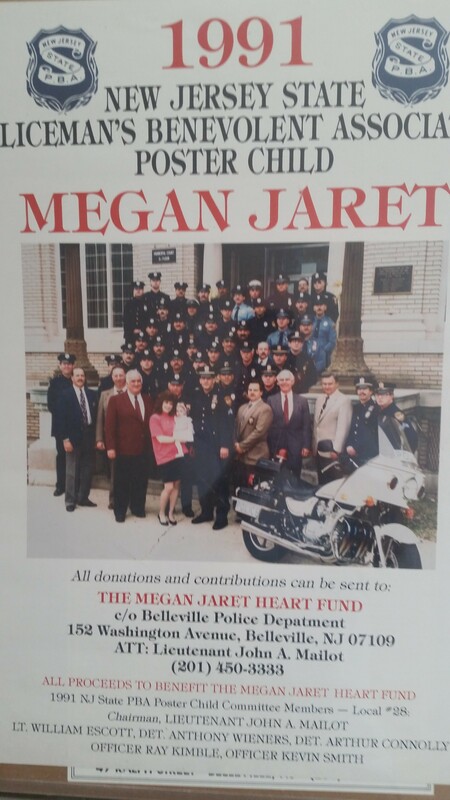 Before telling of the story of how the fund grew from a grass roots community effort to Megan becoming the 1991 New Jersey Police Benevolent Associations poster child it’s important to go back to two EMT’s who responded to a Sunday morning 911 call on October 7th. Megan’s condition was compromised further when she had a heart attack that morning which we heard in chilling real time over her baby monitor. A frantic call to 911 brought a rapid response from the Belleville Firemen Mark Rossi and Mike De Andrea, who reacted swiftly and decisively first stabilizing Megan then sweeping her into the ambulance and nearly flying away down the road. Maureen and I jumped in our own car and drove with great purpose to the hospital only to find the ambulance hadn’t yet arrived. Panic stricken and confused we were quickly triaged to a private room where we waited an grueling 45 minutes before finding out Megan had arrived. We would later find out that the firemen had stopped along the way to administer emergency cardiac stimulation. There is not a single doubt in my mind the two of them could think of little else then their own children while saving Megan’s life. Of course the pair of heroes would later humbly tell us they we only doing their job but they gave true meaning to above and beyond with their desperate efforts. No matter how big and strong you may be no one really wants a helpless child to be part of their job. So a special thank you to Mark and Mike. Leading up to that time our needs both emotionally and financially grew significantly regardless of having the medical coverage Maureen had to leave her job and stay with Megan full time and I picked up extra jobs in restaurants to help make ends meet. The fund that Scott and Chris had started became another focal point of our existence. Belleville Police Lieutenant Jack Mailot had read the story of Megan in the Belleville Times and contacted Scott. He told him that he wants to be apart of the fund – he was a cancer survivor and there was just something special about Meg. He and Tony Weiners, also from the Belleville PD helped to heightened the awareness and assistance and suddenly a huge community that had no idea who we were had started rallying around this young couple with a catastrophically ill infant. Larry Rosenthal, a highly successful businessperson, and his associate Barbara found out about our plight and joined in. Larry became a huge supporter for us when he and Barbara focused on Maureen and I because they realized the caretakers so often go overlooked, especially when the one being cared for is such a beautiful and helpless child. It blew us away, and I admit to many hours of tears of gratefulness in their reminding us that we were human, that we were important, and that everyone cared for all three of us. The need for Megan’s heart transplant also opened us up to an almost sub culture of people who called themselves “The Transplant Community”. There is a slew of people here who helped us emotionally including Rhonda Roby and Peggy Dreker (who’s own beautiful child had a liver transplant) from TRIOS (Transplant Recipient International Organization) and UNOS (United Network for Organ Sharing). Along with the transplant community was our circle of friends. Our “Bridgebrook” family, Kathy and Bob Gandolfi, Mary Bay Pickett, Michael DiFrabizio, Lisa Grabas, and a host of others who were more than merely neighbors shared in our plight. Megan got her transplant at Columbia Presbyterian, and her doctors were nothing short of amazing!! Drs Robert Michler, and Dr Linda Addonizio, who cried with us when Meg died never made us feel that our daughter was not their priority! The entire staff of Columbia most especially the extremely caring compassionate and professional nursing staff who always helped interpret what the doctors told us as well as just making us feel as if they were our family. And most importantly our families, played a major role in helping us to not only get through all the insanity but to help us keep it!!! Maureen’s sister Kathleen and her cousin Laurine, and her best friend Diane, who helped to hold her up and give her the courage to get up and fight another day! Their love and support are still immeasurable today! Her brothers, Michael and Sean, both standing next to us helping to hold us up! Maureen’s Aunt and uncle Mel and Bill, who were by our side when we received the devastating news that Meg needed a transplant, they took our other family member, our little sheltie Kasey Jonze and gave him a nice home while we rearranged our lives. When we had to make a trek to Philadelphia to St.Christopher’s Hospital, my brother Randy and his wife Joyce followed behind us, they virtually never left our side, and helped us settle in our new temporary home while attempting to take our minds off of our peril as best they could. Philadelphia was extremely tough on Maureen who set up home in a chair beside Megan where she watched over her 24/7. After the first month I had to return to work where two of my best friends and co-workers, Wayne Lyons and Vicky Zonana kept me together until I could get back to Philly on the weekends. The two of them along with “Little David” another coworker who since passed away were my rocks and stood alongside me from the beginning of our ordeal. A frienship just as strong today as it was back then despite being miles apart. Then there is our parents, who must have been going through their own agony watching there children suffering and in so much pain over their beautiful granddaughter enduring more pain in her short life, then they did in their lifetime! We know that there are people all along the way that we did not mention, but it does not mean that their impact is any less for us! We are eternally grateful to all that had come to the aid of our little family and our beautiful little Megan!